FILE - Somali soldiers attend a training session during the opening ceremony of a Turkish military base in Mogadishu, Somalia, Sept. 30, 2017. 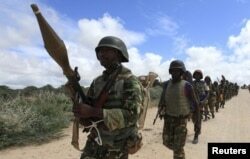 Al-Shabab attacks against African Union peacekeepers and Somali government forces could worsen as troops try to reopen Somalia’s main supply roads, currently cut off by the militants, a spokesman for the peacekeepers warns. Lieutenant Colonel Wilson Rono said the African Mission in Somalia (AMISOM) troops and Somali National Army forces are trying to reopen the highway linking the capital, Mogadishu, to Baidoa, 240 kilometers (150 miles) to the west. It’s one of three main roads linking Mogadishu the south, southwest and central regions. Rono spoke to VOA’s Somali service this week after al-Shabab militants ambushed an AMISOM supply convoy about 40 kilometers (25 miles) north of Mogadishu on Friday, killing at least 10 soldiers and destroying most of the 20 trucks. It was the latest of many deadly attacks the militant group has waged against the AU forces. Al-Shabab was pushed out of Mogadishu in 2011 and in following years lost control of almost all the country’s major towns. It had to resort to “difficult” guerrilla tactics, Rono said. Rono said AMISOM soldiers repulsed another al-Shabab ambush Friday near the town of Fafahdhun in Somalia's Gedo region. He said the soldiers killed 23 Al-Shabab fighters. Mohamed Hussein al-Qadi, the district's deputy governor, put the Shabab death toll at five. “We learn from each incident,” Rono said. “But the nature of the asymmetrical warfare and fighting of insurgency makes you certain that this kind of thing will happen” again. FILE - African Union Mission in Somalia (AMISOM) peacekeepers from Burundi patrol after fighting between insurgents and government soldiers erupted on the outskirts of Mogadishu. The deadly attack Friday occurred near the town of Bal’ad. At least five armored AMISOM vehicles were escorting a convoy transporting supplies to Jowhar, the main headquarters of the Burundian peacekeepers operating in the Middle Shabelle region. Rono said the militants were hiding in thick vegetation along the road when they detonated explosives then attacked the convoy with machine guns, rocket-propelled grenades and gunfire. Just three weeks ago after an attack on a military checkpoint killed several Somali soldiers, AMISOM and Somali troops cleared vegetation along the road to improve visibility and remove possible militant hiding spots. Al-Shabab claimed it killed 23 Burundian soldiers, a figure Rono disputes. “We lost three of our troops and six of them are injured and are here in Mogadishu,” Rono said. But other sources put the AU death toll higher. Burundi Vice President Gaston Sindimwo told VOA's Central Africa Service that five of his country’s soldiers had died. At least 10 AU peacekeepers were killed in the ambush on Friday, according to three separate Somali officials. If correct, that makes the ambush one of al-Shabab’s deadliest attacks on AMISOM since the AU mission arrived in Somalia 11 years ago. AMISOM currently has over 20,000 peacekeepers in Somalia. Last year, the mission announced plans to gradually reduce its troop strength. The Mission says eventual withdrawal will be “conditions-based,” but has made it clear to Somali leaders it wants to see concrete progress in building a national force to take over security responsibilities. Few soldiers have actually been withdrawn, on the grounds that Somalia’s army needs more time to strengthen and cohere in order to hold off al-Shabab. Hussein Arab, former Somali defense minister and current head of the Parliamentary Defense Committee, welcomed the plan to rebuild Somali forces and improve their coordination with AMISOM. “The important thing is that we focus on our forces that will be taking over the security,” he told VOA Somali. Soon after his February 2017 election as Somalia’s president, President Mohamed Abdullahi Farmajo vowed to build a capable Somali army within two years. Farmajo, a dual U.S.-Somali citizen, now has less than a year to meet that deadline.